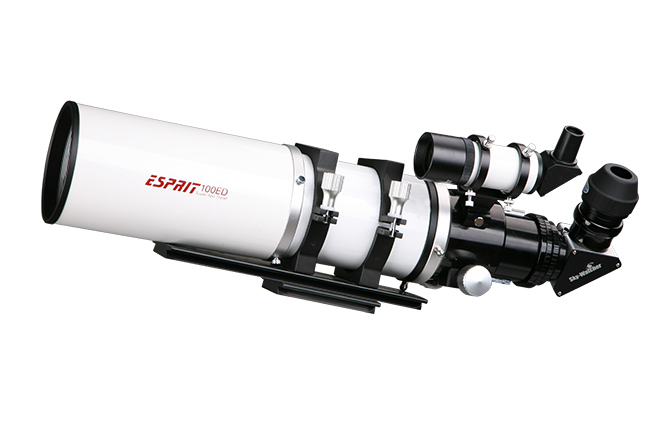 Esprit is considered as the most premium telescope by Sky-Watcher. From the top grade ED glass (S-FPL53) to the fine mechanics of the focuser, it is made with the aspiration for perfection. Adding cherry to the sundae, Esprit has one more thing to offer - flexibility. 1) Photographic wide field: when taking wide field deep sky photographs with CCD cameras, the entire image produced in the focal plane of the telescope is projected on to the flat CCD sensor surface. Here, the magnification is low and a field flattening optical element is very useful. 2) Photographic high power: The central portion of the image produced by the telescope is projected by eyepieces or Barlow lenses on to the CCD censor. There is no need for an extra field flattener to flatten the telescope image edges because these areas are excluded on the projection. 3) Visual use at high power: Here again, only the central telescope image is seen with a high power eyepiece. The image will be perfect without field flattener and there is enough backfocus (*) for other accesories, for example, a large size diagonal mirror or an erect image prism. 4) Visual use at low power: Human eyes are adapted to correct small image distortion (curvature), as do many eyepieces. Therefore, when studying the night sky at low power wide field, the differences between using and not using field flatteners will be undetectable. However, the limited backfocus of field flatteners will prohibit the use of larger accessories. For this reason, it is generally not recommended to use a field flattener in visual use. As illustrated above, the Sky-Watcher Esprit 3+2 design allows alterations to the lens arrangement for optimum image quality under different levels of magnification. Coupled with the premium optical glass (ED type S-FPL53 glass and Schott glass), Esprit is destined to bring your sky-watching experience to a whole new realm. (*) backfocus is the available space for components or accessories between the telescope end (can be the focuser in its shortest position or the field flattener) and the CCD camera or the eyepiece. When employing field flatteners, the position of the CCD chip of the camera the field flattener must be exactly where the design prescribes it to be. An error of a few millimetres can seriously affect the quality of the image.